Ferrite Inductors and AL Values. 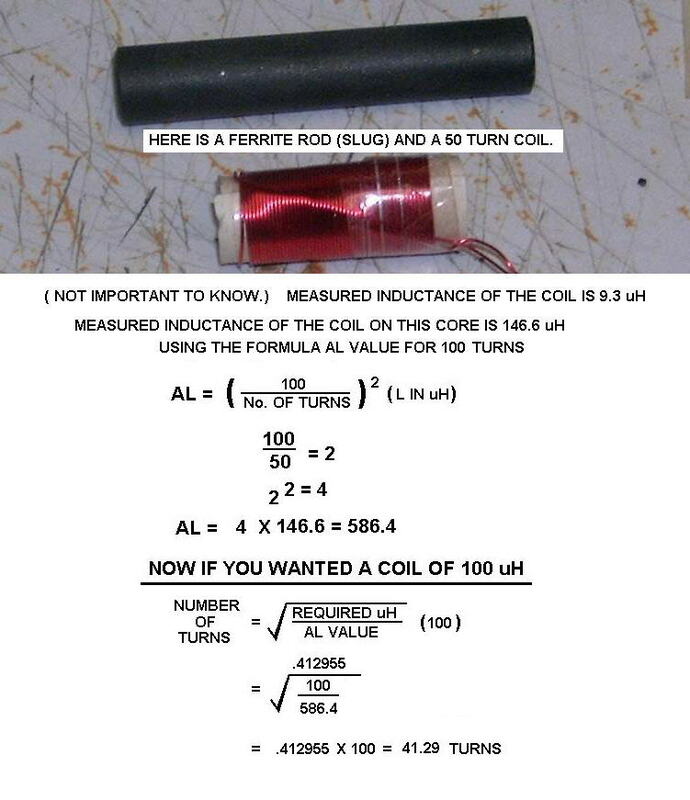 This article is to help those persons wanting to wind coils on Ferrite Inductors. Or for that matter, Iron Core Inductors Also. 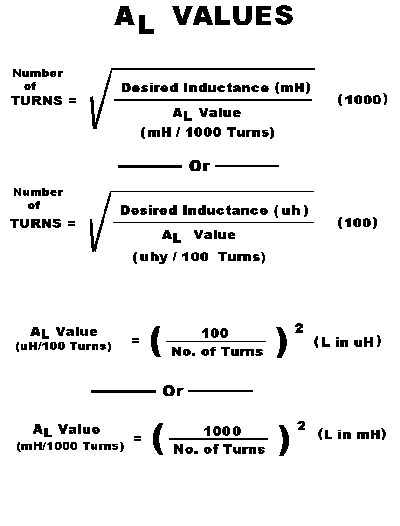 calculate the turns required for winding different Values of Inductance on Specific Inductor Cores. You "Do Need an Inductance Meter", Or some other method of Determining the Inductance. A Signal Generator and a Oscilloscope would work, using a Known Capacitor to create a Resonance. Wind a Specific Number of turns on the Unknown Core. Note: More Turns Results in a More accurate answer. I usually Recommend 100 Turns, but if accuracy isn't important, 10 or 20 turns will do. You can determine the AL Value in uH or mH. As an Example, I wound 20 turns of wire on a Ferrite Rod. The Measured Inductance was 22.4 uH. Now lets assume you want a 100 uh Choke, based on the Above AL Value. Or at least that was what I had to wind on this particular Ferrite Rod, in order to Measure 100 uH. If I had of Initally Used "100 Turns", I would have acquired a More Accurate " AL Value ". And I'm sure it would have come out closer. I use these formulas Quite a lot when I acquire Batches of Unknown Ferrites. I usually Test Two in a batch by just slipping the coil off of one and onto the next. In Most cases the results are pretty consistant. AL Value to make whatever I want. You "Must" Gap it for your Inital Winding, Or you will NOT get a Correct AL Value. "Back to My Projects Page"